It's National Read Across America Day, aka Dr. Seuss Day. Take some time to read a book today and share with someone you know. We thought we'd have a little fun and share one of our graphic creations from two years ago since today is also Caturday Art day. Those are both cute graphics. Happy Seuss Day Super Suessers! You are both such pretty kitties! Happy Dr Seuss Day! 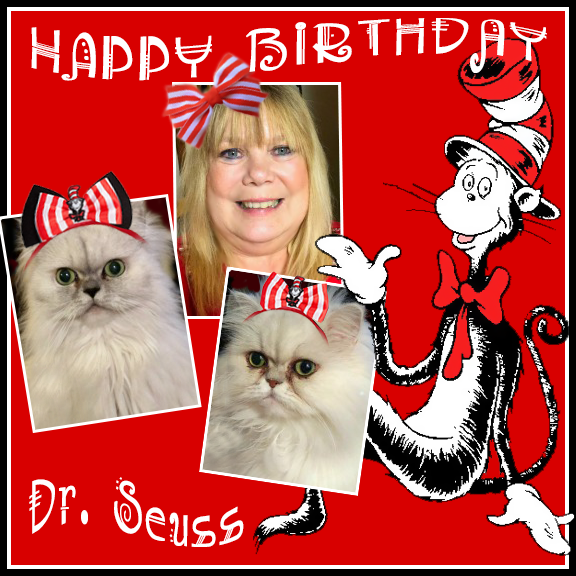 What fun graphics and an adorable Seuss family pawtrait! You have The Cat in the Hat quite smitten. His smile is wide and his hat is a tippin.' I think he wants to court you. You are the prettiest silvery two. Winks and kisses. Happy Dr.Seuss Day! Super cute! 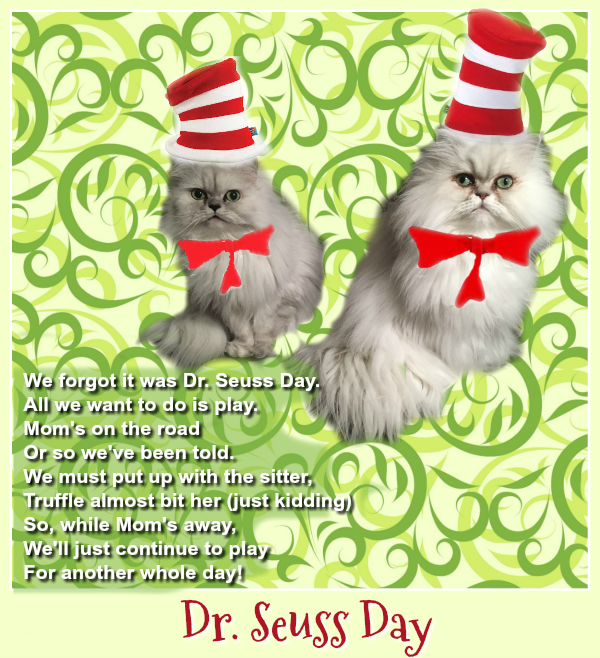 Happy Dr Suess day - very cute graphics and creative poem. Thanks for participating in the blog hop. MOL about cats at play while the Mom was away. Truffle and Brulee look adorable in their bows. You two would make the perfect models for a Dr Seuss adventure. Belated Happy Dr Seuss Day. Our previous attempt did not get through, but we are have good luck commenting tonight.